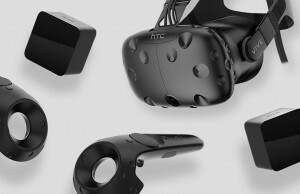 Revealed this week at CES 2018, HTC has announced their own Vive Wireless Adapter which promises to break the tether on the Vive and Vive Pro. We went hands-on to see how it handles. 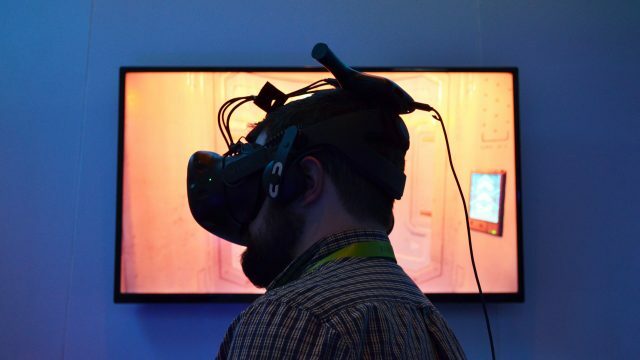 One year after announcing their intent to create a wireless adapter in collaboration with Intel at CES 2017, HTC revealed the Vive Wireless Adapter this week at CES 2018. The T-shaped device is based on Intel’s 802.11ad ‘WiGig’ 60GHz transmission technology and DisplayLink’s XR codec. It’s a later cousin of the various prototypes from Intel and DisplayLink that we saw earlier in 2017, but now with a new antenna design and soon to be packaged up for retail. HTC says the Vive Wireless Adapter will support both the original Vive and the Vive Pro. 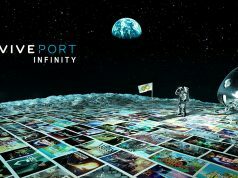 The unit is planned to ship worldwide in Q3, though a price has yet to be announced. I got a chance to test a pre-release version of the adapter at CES 2018, where HTC was showing it off attached to the original Vive running Doom VFR (2017). 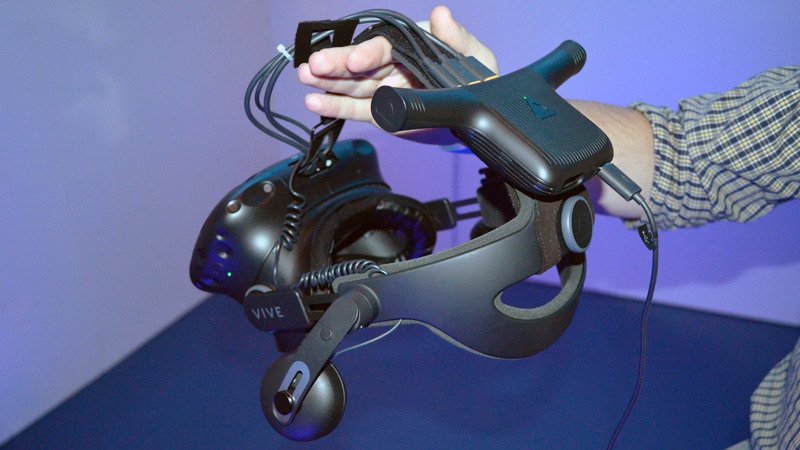 The Vive Wireless Adapter hasn’t yet been shown running with the Vive Pro. It appears that a set of short cables—that run from the headset’s ports right into the adapter—replace the existing lengthy tether. A single cable dangles from the back of the adapter which connects to a battery pack that you can tuck into your pocket. 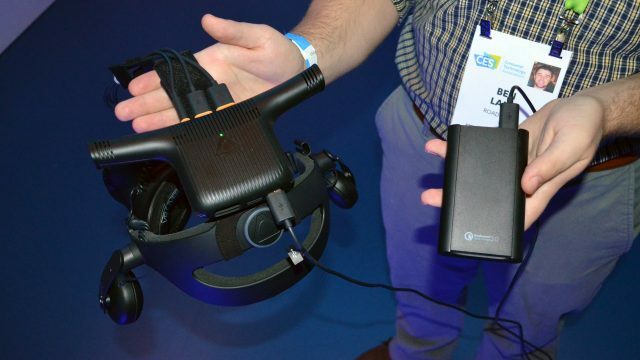 The battery pack appeared to be generic, and HTC said it wasn’t indicative of what would be included with the final Vive Wireless Adapter. Target battery life wasn’t mentioned, but this will surely depend on the battery capacity that they choose for the finished product. As I was putting on the headset I could feel that the unit was warm, but not hot to the touch. 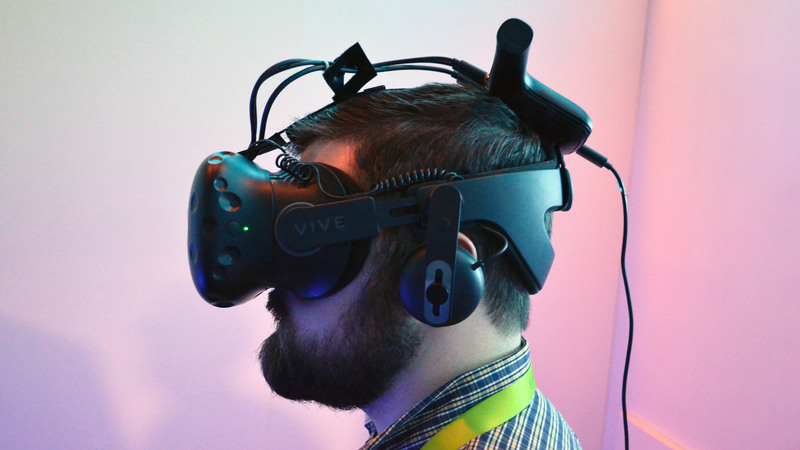 The Vive Wireless Adapter sits just behind the top of the head. Since it’s attached to the Deluxe Audio Strap, it’s mostly isolated from touching your head; I couldn’t feel the heat from the unit through my hair, but we’ll have to wait and see how it feels over longer play sessions (and for people with longer hair). 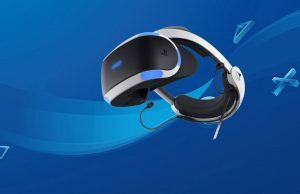 So too will we need to wait to find out how comfortable it is when mounted on the default soft Vive headstrap. 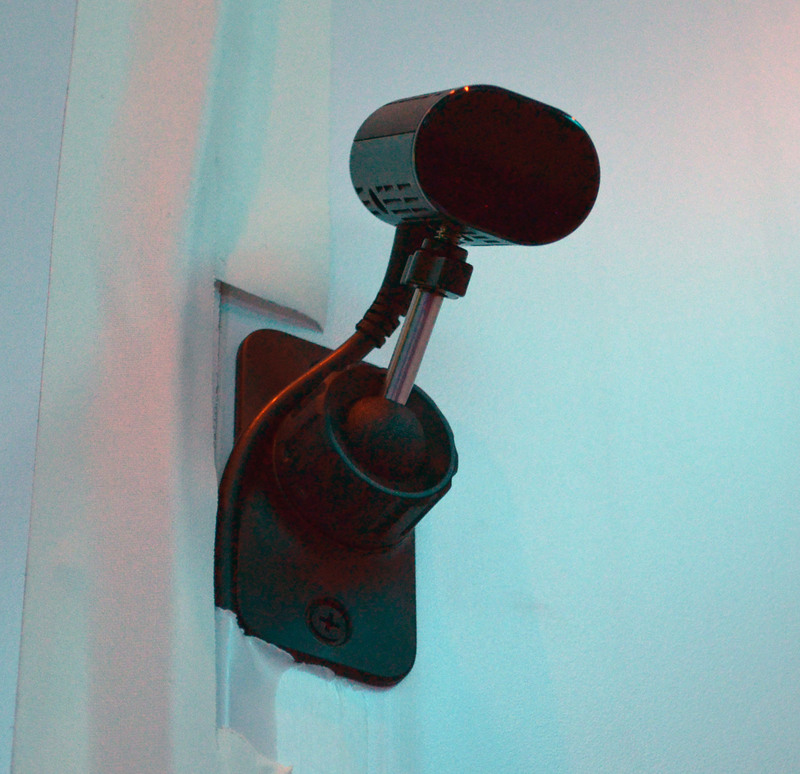 In the demo booth, the transmitter, which looked like a little webcam, was mounted above head height on the wall, and aimed down into the center of the room-scale playspace. As this is 60GHz transmission, direct line of site is necessary for proper performance. Looking through the headset, the image quality appeared very good when my head was moving slowly or was mostly static. Even things typically difficult to compress (like fog and particle swarms) appeared to be rendered very well. I would say, at least in the content that I was shown, the image quality looks indistinguishable from tethered when my head was static or moving relatively slowly. I did seem to notice that when I rotated my head very quickly, the image appeared to get a bit blockier, but it would very quickly snap back by the time my head slowed back down. 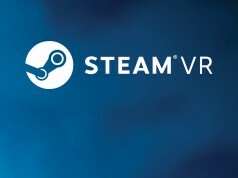 It was subtle enough that I don’t think most VR users would notice it. Of course, the content shown in the demo is likely picked as a best case scenario. I didn’t have a chance to pull up content that would offer a true stress test for the compression, so it remains to be seen how it will handle other potentially more challenging compression scenarios. The flip side of the impressive image quality is noticeable latency. It wasn’t horrendous by any means, but I’m confident that in a blind test between a tethered Vive and one using the Vive Wireless Adapter, I’d be able to pick which is which with 100% accuracy. It may be subtle enough that some users wouldn’t notice it outright, but they may end up feeling it, since higher latency can cause accumulating discomfort. The fact that there was noticeable latency actually surprised me. 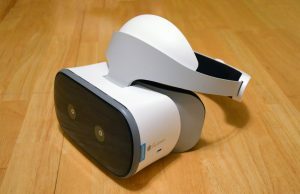 When I tested both the Intel WiGig VR and DisplayLink XR prototypes last year (precursors to the Vive Wireless Adapter), I was quite impressed with what I saw, including such minimal latency that I wouldn’t count on being able to pick between a wireless and wired Vive in a blind test. We’ve reached out to HTC to ask why the latency was apparent when earlier tests with similar components and codecs seemed to have tighter performance. 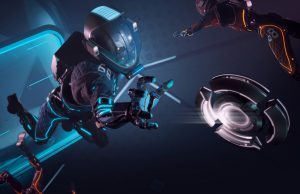 It remains to be seen how the increased resolution of the Vive Pro will impact the latency. One possible explanation for the latency is that the system might have been optimized for greater robustness of the connection. Indeed, the Vive Wireless Adapter didn’t appear to stutter once in my 20 minutes or so playing with it. Testing the limits of the system, it took me cupping my hands over both ends of the antennas and then my colleague covering the transmitter with his hand before the connection finally gave out. I also waved my hands wildly above and around the antenna and didn’t spot any obvious change in quality or latency. This bodes well for the system’s performance in the less-than-ideal environments that will surely be encountered as the unit rolls out to homes and businesses. Latency aside, the freedom of room-scale tracking and no tether is wonderful. 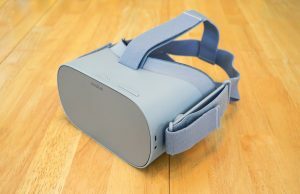 I’m so used to tethered VR headsets, and subconsciously managing the cable by pushing it out of the way with the back of my arms or stepping over it, that it took some time before I unlearned that behavior and really took advantage of the fact that I could move around easily in all directions unencumbered. 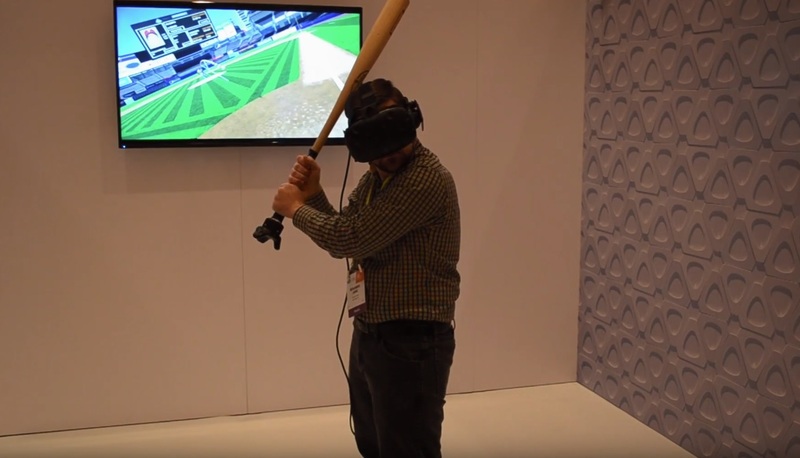 If a flawless wireless experience can indeed be delivered, it’s going to be especially useful for highly active content like cover shooters, boxing, and games where you take big swings, like when using virtual bats, swords, and golf clubs (or even real bats). With two quarters to go before the planned launch of the Vive Wireless Adapter, I suspect there will be more tuning to come, which will hopefully bring about latency improvements. 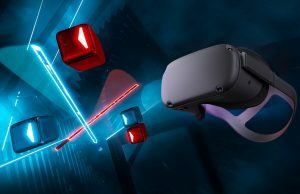 In the future we also expect to be able to test the Vive Wireless Adapter with the Vive Pro. For the love of god, why are they not moving as much weight as possible to the waist? Who would want all that EM on their skull? And you then you would also have a much thicker cable(s) going up your neck, eliminating some of the benefit. I thought the TP Cast seemed to have a good balance. They have the Signal router on the head and the battery pack at belt level. I was excited by an official wireless solution, but it looks stupid as hell. Well, sure, it looks dorky. However, I don’t think adding device will be the tipping point that keeps folks from mistaking me for Chris Hemsworth. 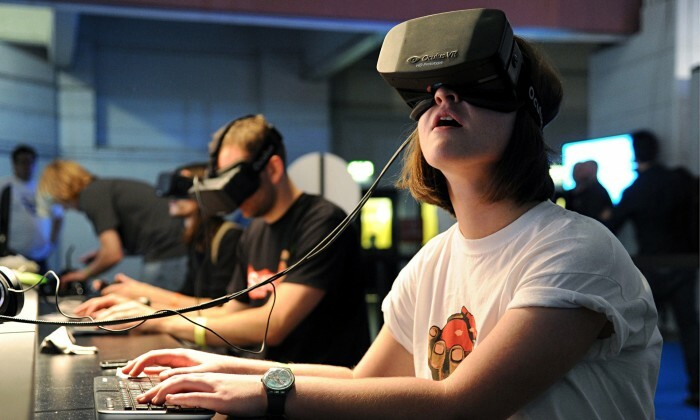 Well, it’s not like anyone looks cool with a VR headset on anyway. Perhaps not cool, but Oculus for instance looks fairly neutral. HTC vive i must admit is quite an ugly design (uglier still with the pro). I’m more concerned with the weight than how it looks. I have a vive and it’s heavy. A. It is primarily a receiver. It emits very little EM radiation. B. The high frequencies it uses are blocked by skin(among other things). It HAS to be above everything else, because it requires uninterrupted line of sight. Point C is false. There is a lot of harmful electromagnetic radiation including but not limited to x-rays and gamma rays. This wavelength is probably safe though. There is some compelling evidence that living near power lines are harmful to your health. It’s all circumstantial; nothing’s been proven. Can’t find the full lecture anymore, but I’m sure you could find it if you put in some effort. Anyway, this is all recent research, but the results are scary. Video doesn’t say what you claim it does. 0/10 for being both late and wrong. Fine, so leave the antena up there but why does the rest of it need to be there? A cable going down my spine is far less annoying than this bulky apparatus that sits on the top of my head. This tech will not take off if these things are not addressed correctly. You would lose signal along the antenna cable and would need even more power. THe back can take a ton of weight. Because EM radiation is non-ionizing radiation. Therefore it does not harm you. The dangerous forms of radiation are things like gamma waves and X rays. Those are ionizing. No, all electromagnetic radiation is not non-ionizing. Gamma rays and x-rays are in fact examples of ionizing electromagnetic radiation. What I meant to say is not all EM radiation is dangerous. I mixed up what the scale was reflective of. The second part of statement was correct. Most of the electronics are in aid of driving the antennae and must be very close to it. There’s not much that could be seperated out. Wireless transmission on the 60ghz spectrum can’t even penetrate the skin but yeah keep babbling and being ignorant. But keep babbling and being ignorant. 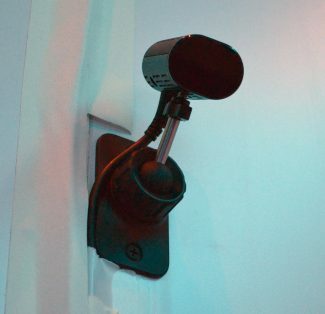 The unit on the skull is mostly a receiver, the video which is the bulk of transmission data is transmitted from the device mounted above head level within the room. It is a very line of sight frequency, and will pretty much turn your play space into a walk in low power microwave oven. Ah awesome, that’s fine then, nothing wrong with walking around in a low powered microwave oven daily, amirite? Any information about using multiple wireless adapters in the same space? 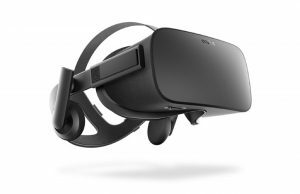 Like the tpcast business edition? 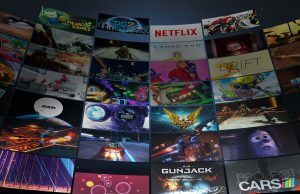 The new SteamVR Tracking 2.0 says it supports multiple headsets within the same play space, as well as at least 4 base stations, for a 10m x 10m area. As for multiple wireless though… that is a good question. How does it know which is which? Even SteamVR 1.0 tracking theoretically supports unlimited headsets and trackers, because it’s up to them to track themselves based on the swiped lasers. The limitations are caused by occlusions, computing units (PCs) and wireless transmissions for untethered devices. You’re correct. I was thinking of 2 of the same units on the same pc. My bad. TPCast feels lag free, so they have to match/beat that! And if this is tested on the old Vive, then what happens when they need to push 78% more data through on the Pro? – more lag? I don’t think the latency is related to transmitted resolution as that is a bandwidth issue and WiGig should in theory provide ample reservers. I suspect the latency is down to the processing unit within the receiver module and that might either be under-powered or its firmware might not quite be up to scratch. I’m very much enjoying my TPCast v1 for my Vive running OTC/VH but have just sent back my TPcast v1 for Rift as I’m interested to see how the announced TPCast v2 will perform. VivePro will intially be wired and if we get good reviews on the Vive Wireless Unit for Pro, I’ll get that as well. Radio is photons – there is no latency. It all comes from processing. In this case video encoding and/or decoding is probably the worst culprit. I’ll stick with a tethered connection. Faster, more reliable, no latency, and less weight on the head. Not to mention, it can’t be entirely healthy to strap a wireless receiver to the top of your brain! Receiver by definition cannot affect anything. While most of the data does go to the receiver, the Vive has to send orientation and location data back to the PC somehow. Sure, but that’s no more dangerous than the radio installed in every Vive headset so that the headset can communicate with the controllers. 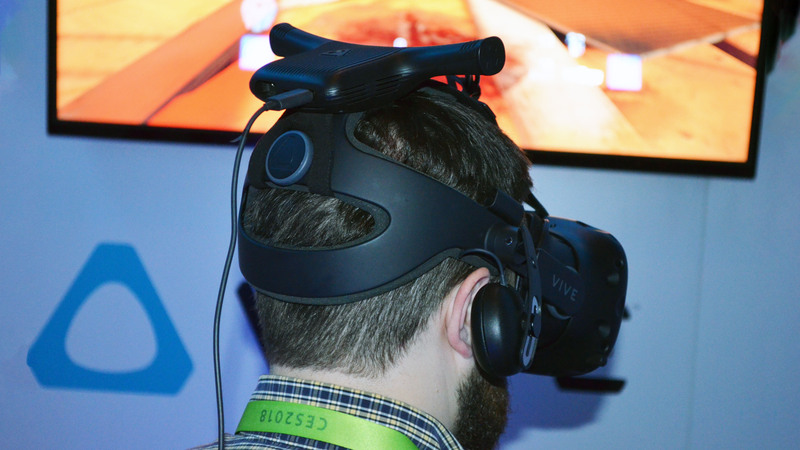 Every wired Vive still has a transmitter strapped right in front of the user’s eyeballs. 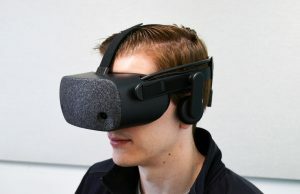 Anyone who wants to avoid crippling brain damage needs to give up on VR entirely, because the headsets blast their faces/brains with radio waves, and so do the controllers whenever they’re near the head. And surely all those radio waves from the controllers can’t be good for the hands. Radiation intensity decreases with the square of the distance so the transmitters in the Vive and controllers are giving you far more radiation than the video transmitter will. I’m a strong supporter of using wires wherever possible for the reliability, bandwidth, and minimum latency. ‘Never could understand folks that use wireless keyboards/mice for their desktop systems that never move (except for rare cases of wire-routing difficulties). Still, I’m happy to see the forward evolution of wireless technology. Eventually, it will be worthwhile. The longer version: I am using my livingroom tv for gaming. Wired is not an option on the couch or it gets messy. Wife is already annoyed by the rear satellite speakers which I set up for gaming sessions, and my dog bumps into them. I don’t need another pair of cables for my dog to stumble into. Reliability depends on the situation and for the purposes of human interaction the latency of wires and wireless are the same. Particles/waves don’t travel much quicker through copper than air. It’s easier to achieve higher bandwith with copper but there is no technical limit to transmitting through air, unlike copper which definitely has upper limits. That’s why fiber replaces copper for higher bandwidth applications. I went wireless mouse because for my setup I’m sick of cable drag, I could never find a solution to it, plus these new logitech mice have even faster latency than most wired mice. You don’t strap it to your brain, you strap it to the headset. It’s recommended to leave the skull and scalp in place, because they completely shield your brain from 60GHz radiation–something they don’t do for the 2.4 to 5GHz radiation coming from every other wireless device in your home/workplace. shorter wavelength means it hits stuff. Or if you want the context clues explanation, the article says it needs line of sight, meaning it doesn’t penetrate solid objects. Then there’s my own personal experience. My 2.4GHz network can reach outside the house. My 5.0GHz network on the same router can’t cover the whole house effectively. Then there are my 5.0GHz headphones that have a noticeable drop in audio quality if just one wall gets between them and the transmitter. (They’re on a different channel than the 5GHz network to avoid interference.) Finally, my 60GHz TPCAST experiences major signal degradation just by putting my hand over it. If that Wikipedia article is correct and relevant (and I have my doubts, especially since the author didn’t explicitly define all the variables used), it’s still overlooking whatever real-world phenomena actually affect different wavelengths. And finally, a research paper titled “The Human Body and Millimeter-Wave Wireless Communication Systems: Interactions and Implications” has a chart on the fourth page that shows 60GHz penetrating less than 1mm into human skin, with lower frequencies penetrating much farther. Thanks so much for your reply, I’ll look into that with great interest. What bothers me is that we don’t have yet clear data on the physiologial and biological impact of those EM frequencies. The World Health Organisation classified mobiles phones frequencies as “possibly carcinogenic” but it is still inconclusive. They range from 400 MHz to 3.5 Ghz. On a personal aspect, I experienced many times Wifi interruption when I fired a microwave oven in the house, which is quite worrying as those waves are designed to cook things containing water. 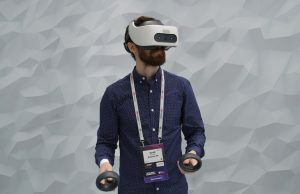 Can I just fast forward to 2020 when we have all inclusive HMD’s that have built in wireless, and the base stations are combined with the wireless transmitters, and the headset has 200+ FOV with at least 3k per eye? You are destined to start right here, in 2018, experiencing a forward movement towards the future at the rate of one day per day, eventually turning into 2020 after 2 X 365 days have passed. There is no fast forwarding. I mean, maybe he could speed things up from his subjective perspective with a series of really long naps. You would have to take up a strict life style of conserving every one of your waking minutes for something productive while every bit of useless time is used for sleep. Or long VR sessions since time dilation can occur. Houuu houuu houu… Son.. You haven’t experienced a radical drug binge before, have you? Two years?… More like 3 months. 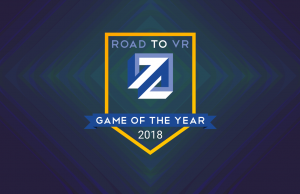 You mean consumer VR Gen1? Didn’t happen, looks like it won’t happen for Gen2 either. 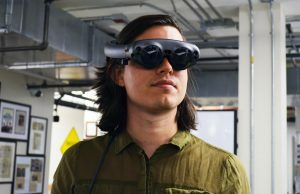 Oh and don’t forget that there’s no such thing as “all-inclusive” (or even an actual Virtual device for me) without basic/starting hand-tracking, inside-out tracking, see-through AR. However 200+ FOV is highly more challenging than resolution or wireless. Sure, just pay someone to sustain you in a coma for two years. That’d be awesome but they can make much more $$ if they release something every 6-12-18 months. One or two new add-ons / improvements is enough for people with disposable incomes (or looming bankruptcy) to buy in or upgrade. 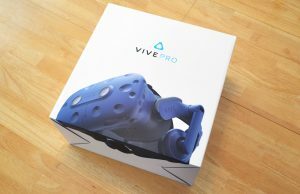 And in this instance, I’ll pony up the $$ on day one (already pre-ordered the Vive Pro)! Why the hell would they use Doom VFR to demo this thing? 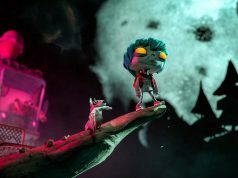 That game freezes and dynamically lowers its resolution even on a tethered Vive being powered by a beast PC. Who’s making these decisions? Fire him. I have had zero problems playing Doom VFR. No freezing, if its dynamically lowering the resolution I haven’t noticed. Seems like there’s a lot of inconsistency for a lot of users. I know I had lots of problems with Doom VFR. Nothing that prevented me from completing the game, but I had a lot of issues that I initially thought were the fault of my TPCAST. 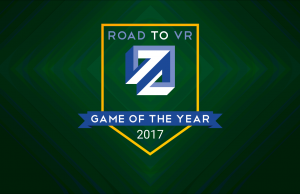 Once I tried other VR titles, I realized the fault lied with Doom VFR. I still enjoyed the game, but wow is it buggy. It feels much more like a Bethesda product than an Id product in terms of lack of polish. It looks utterly ridiculous. Baby deer antlers? Mini devil horns? 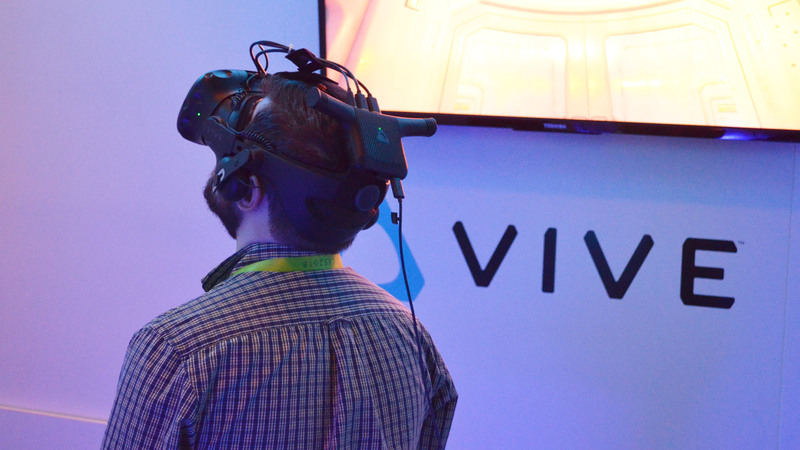 Vive is already a very heavy and clunky device and adding this thing to the top of your head surely won’t help – your neck will hate you pretty soon. Actually it may help by counterbalancing some of the weight of the front-heavy Vive. The neck can take a lot of weight (for example motorcycle helmets) – it’s unbalanced weight that’s hard on it. Any word on the headset to PC link? The Vive Pro has two cameras so it’s going to need to send quite a bit back to the PC. And if the cameras are used for AR they and the reverse link are going to need to be very low latency as well. How does the latency of the first-party Vive adapter compare to that of the TP-Link system, do you think? I know you haven’t had a chance to do a head-to-head comparison yet. 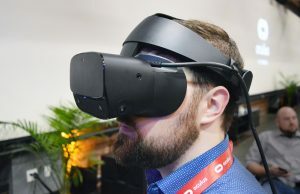 My main concern is not the looks, why should anyone care for his/her looks while wearing an hmd, if so dont buy an hmd cause they all look ugly, but its not a fashion thing an hmd. Even though i have my vive tethered i have managed to make the best setup for cabling management and comfort, its quite good, my cables never touches the floor and its impossible to step or trip and i got enough length (cables) to reach every corner of my room (about 5.5mx3.5m). Having said all these i still interested in wireless, BUT the real main concern we should have and thats regadless or my or your opinion is health, sure that strong signal wireless device strapped to your head will have line of sight to transmitter and also will have a strong signal broadcasting right from your head, that cannot be good, what health issues can come later in life if you use it in average just 1 hour per day, so before i go and check latency and picture quality i will find out about health issues, especially with that 60ghz, we should all look into this seriously, passing our unprofessional opinions back and forth is of no use unless u r a qualified doctor with knowledge of this precise issue. When i do find out i will post here again and will tell u the reality of things, if its 0% damaging i will buy the tpcast model, till then i remain head signal free lol.. Finally, HTC is onto something that was obviou from the start. Wireless adapters area prerequisite, and I’m glad the realization is finally catching uo with the vision.